The common skin disorders that we all face are pimples, acne, skin allergies and viral infections. These skin infections occur due to several factors like overmedication, unhealthy diet, polluted water, radiation, and sun exposure. There are countless products which are readily available in the market to treat these kinds of infections which may show a negative impact on the skin. The above skin conditions can be treated effectively by natural herbs which are experienced by our ancestors. Herbs are loaded with high content of essential nutrients, and these are chemical free. I am introducing some potent herbs for different skin diseases through this article. We can reduce skin inflammations and skin allergies by using some powerful home remedies which may help you to treat skin infection on your own. The presence of high medicinal and healing properties in natural herbs helps to alleviate different types of skin disorders. Holy basil (Ocimum Sanctum) is well known for its exceptional healing and medicinal properties. It is packed with essential anti-inflammatory and antibacterial properties which can effectively treat skin allergies without causing damage to your skin surface. 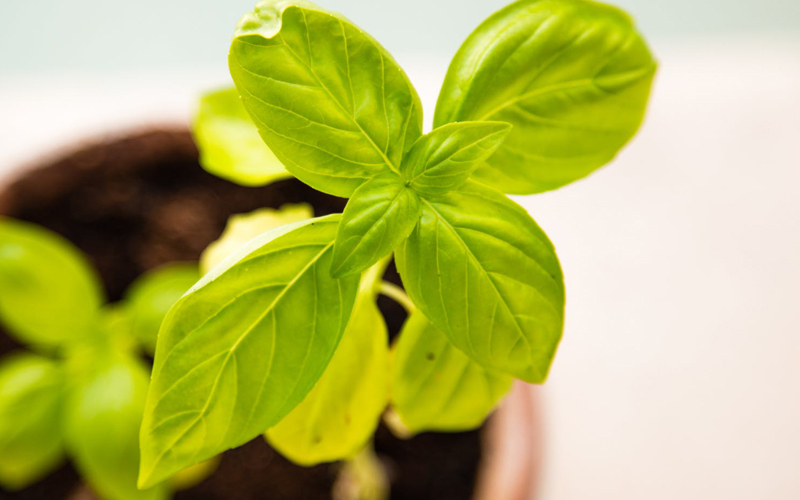 Blend some fresh holy basil leaves into a fine paste and add a tablespoon of salt to it. Apply the mixture to eczema or skin rashes and other affected areas on your skin and leave it for 2 hours. Continue this process for at least two days. Regular usage of these medicinal leaves offers several health benefits due to its expectorant, antibacterial and antibiotic properties. It is sufficiently enriched with phytonutrients, antiviral and disinfecting properties. The juice extracted from Tulasi leaves can cure fever due to its powerful antibiotic properties. Consume 1 ounce of holy basil (Tulasi) juice 2-3 times a day to bring down the fever. Consume one teaspoon of Tulasi juice with some honey on a regular basis to avoid cold and flu and other throat infections. Aloe vera is one of the best beneficial herbs due to its unusual properties. It is highly abundant in antioxidants, proteins, minerals, antibacterial, and anti-inflammatory properties. Its deep penetrating capacity allows it to penetrate deep into the skin pores and helps to remove bacteria. You can use aloe vera to treat skin conditions such as white spots, blackheads, pimples, acne, and blisters on the skin. Grind few leaves of holy basil into a fine paste and mix it with 4tablespoons of aloe vera gel. Apply the mixture on white spots or black spots and all affected areas. Leave it for 30 minutes and rinse it off with lukewarm water. You can also rub aloe vera gel on infected areas to relieve itching and to sting. The presence of essential vitamins like vitamin-E, C and vitamin A in aloe vera works excellently to clear pimples and acne. It improves the elastin of the skin and boosts up the collagen. This beneficial herb helps to get rid of pimples and acne. Moreover, regular usage of aloe vera to your face provides hydrated and glowing skin which also reduces wrinkles. Consumption of fresh aloe vera juice offers numerous health benefits. Mix one tablespoon of fresh aloe vera gel with few drops of fresh lemon juice and massage your skin with it. Leave it overnight and rinse it off with regular water on the next morning. Proper usage of aloe vera gel on the face gives youthful, glowing skin. Aloe vera gel can reduce muscle pains due to its anti-inflammatory and other essential medicinal values. Being experienced it personally, I recommend this curing gel to alleviate pains. The addition of castor oil to aloe vera works excellently to treat muscle pains. Castor oil acts as painkiller due to its pain relieving properties. Boil 300ml of castor oil in a container for 5-6 minutes on a medium flame. Add 100ml of aloe vera gel to it and leave it to get lukewarm. Spread the mixture on painful areas and massage gently by applying little pressure with your hands. Continue this remedy for two days to relieve muscle pains. It is one of the most significant medicinal plants used to treat various skin diseases. It is abundant in salicylic acid and anti-inflammatory properties which penetrates into the deeper layers of skin and helps to remove bacteria and fungi. It works great for rashes and skin allergies due to its powerful antioxidants. Grind few leaves of mint by adding few drops of fresh water to get a constant paste. Add a tablespoon of fresh lemon juice to it and mix them well together. Apply the mixture on affected areas and rinse it off with clean water after 30 minutes. Mint is loaded with high antibacterial and antifungal properties which can fight against the bacteria causing acne and pimples. It can fade away the acne scars and spots by boosting up the collagen and elasticity of the skin. Blend some fresh mint leaves into a fine mixture and mix it well with a teaspoon of raw honey and few drops of fresh lemon juice. Apply it on your acne and acne scars and let it for at least 30 minutes. Rinse it off with clean water. Repeat the procedure thrice in a week for desired results. Wild indigo is referred as ancestor’s medicinal plant as it has been using for centuries and proven to treat eczema and psoriasis. Several Ayurveda books revealed the secrets of wild indigo and its therapeutic benefits. The addition of butter to it helps to treat these skin conditions due to its lactic acid and gentle cleansing properties. Blend some wild indigo roots into a fine powder and transfer it to a clean bowl. Add two tablespoons of butter to wild indigo powder and mix them well together without any lumps. Apply the paste to your skin covering all the affected areas. Leave it overnight for quick results. Chickenpox is a skin disorder which includes red blisters on the skin with itching nature. Neem leaves works effectively to treat chicken pox due to its high antibacterial properties. The presence of anti-inflammatory and antifungal properties of it help to reduce chickenpox disease. Its antimicrobial properties and its medicinal values help to alleviate the pain and itching. Grab a handful of fresh neem leaves and clean them with water. Grind them into a constant paste and add a teaspoon of natural turmeric paste. Apply the paste to chickenpox affected areas and let it for 4hours. Repeat the procedure twice in a day to relieve the pain and to reduce the inflammation of the blisters on the skin. Eczema is a common skin disorder which is associated with itching and inflammation of the skin. Neem leaves can reduce the swelling and abrasions due to its antiviral properties. It fights against the bacteria causing inflammation and knocks down them. Grind few fresh and cleaned neem leaves into a uniform paste and add a teaspoon of turmeric powder to it. Apply the mixture on the affected areas and leave it overnight. You can also add neem infused water to your bath water to reduce skin inflammations. Hibiscus is referred to as Botox plant, and its leaves are well known and used for natural hair growth. They can also be used to treat skin conditions such as pimples and acne. These leaves are enriched with essential organic acids which can prevent hyperpigmentation, black spots and remove white spots on the face. Grind 10 to 15 leaves of hibiscus and apply it on your skin. Rinse it off with lukewarm water after 30 minutes. Sage (Salvia Officinalis) is loaded with an unusual compound named Rosmarinic acid which acts as a natural antioxidant. Being rich in vitamin-C and other anti-inflammatories, and antifungal properties, sage leaves help to inhibit skin infections. The presence of phenolic acids and flavonoids in it helps to treat several health disorders. Add some fresh sage leaves to a cup of water and let it boil for 4-5 minutes. Strain the water and consume the sage tea once or twice in a day to gain all its valuable health benefits. You can also add some honey to it for deliciousness. Hi, I am Megus Keerthi. I am a beauty and health suggester. Today health and beauty maintenance much essential. We are spending much money to protect our health, but we can wellness by following some simple tips and usage of home ingredients.